This is matured in American oak quarter casks, where at least some of those previously have held Islay whisky. Malted barley and citrus in the smell. Like lemongrass. Light sweet peat and vanilla as well. A light burn and citrus at first in the taste. Sweet vanilla again with some grassy and earthy notes in the finish. Some fruity notes like apples and pears, but also some sweet raisins comes to mind as well. Overall a very light expression. 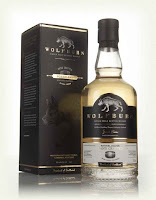 Another quite promising whisky from Wolfburn. They aint there quite yet, but it definitely seems like they are on the right track. A bit too light in my opinion, but a fine dram. Can´t wait for this stuff to get a bit older! I will give this 80/100 (19/21/20/20).